Using social media for generating funds in India! Indian NGOs have come a long way in terms of raising funds for charitable causes. While most major Indian NGOs have a fairly good web presence since the past few years, GiveIndia and GuideStar India has emerged as mature online platforms that allow online donation, fundraising and linking potential donors to the correct charities. Until recently, NGOs in India have had a tough time raising funds though traditional channels like personal appeals, expensive advertising banners, seeking famous brands mascots, hiring committed volunteers who can spread the message, holding events and so on. 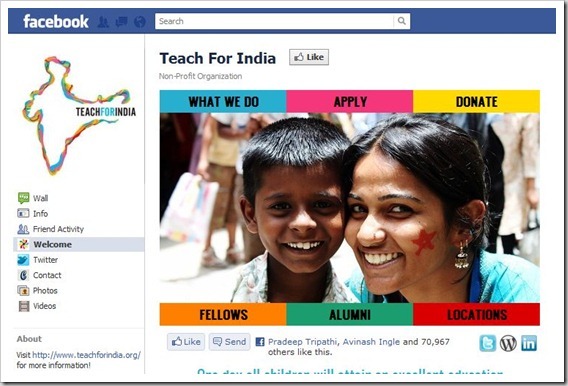 1 How is social media being used in India to raise funds? How is social media being used in India to raise funds? Mint quotes an example of how a 23-year-old engineer working for Teach for India wanted to raise Rs. 50,000 for buying academic materials to teach his students. He simply set up a pledge on GiveIndia in 2011, posting details about the funds he wanted to raise. This pledge was a part of GiveIndia’s India Giving Challenge, a 6 week online fundraising event in which participating NGOs and corporates set up fundraising pages online, outlining their causes and goals. By utilizing the sharing option on Twitter, Facebook and GiveIndia’s own database, they reached out to friends, family, acquaintances, stakeholders, clients and donors to seek donations. Since this event started in 2009, it has nearly doubled the total funds generated and seen a substantial increase in terms of the number of participants. It further reported that Teach for India was one of the champion fundraisers only because of their effective use of Facebook, Twitter and other online social networking tools. Udani stated that Teach for India utilized Facebook very well for the challenge. They went up from providing only 10 referrals to more than 1000 per day to the GiveIndia site. On the other hand, Surf Excel celebrated the 2011 Joy of Giving week through a unique social media initiative by contributing products to NGOs, as the HUL website reported. Users were asked to visit the Surf Excel Facebook page. 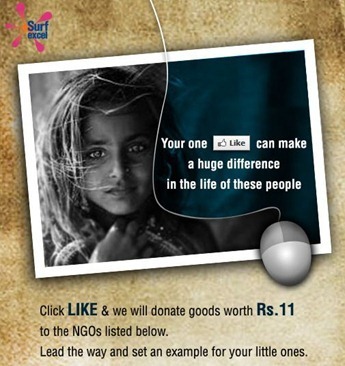 For every ‘Like’, Surf Excel donated Rs 11 worth of goods requirements to charity organizations around Mumbai. Users could also go to the ‘Make a difference with Surf Excel’ section and invite friends or upload a badge on their profile picture to inadvertently promote the cause and display their support. HUL employees were personally involved in the distribution of goods to the NGOs generated through this unique form of social media fundraising. Images, videos and testimonials of their experience were posted back on the online Surf Excel community to maintain and increase traffic. Similarly, many other Indian NGOs are using social media to leverage promotion and fundraising. Active Twitter usage helps in making donors believe that the NGO is consistently going something good. Crowd Sourcing is a technique that allows customers, employees and stakeholders to supply ideas, designs and features for a business’ products or services. In India, The Joy of Giving Week has also been successful in using crowd sourcing for fundraising for other NGOs. With the coming of age of coupon and deal sites like Snapdeal and Naaptol, they can become platforms for listing special vouchers and deals, the margin of which would be given as proceeds to NGOs. The popularity and large visibility of such sites can also help in promoting a charitable cause. Instead of having generic open ended donation campaigns and volunteering initiatives, the use of social media pages can help NGOs to fix countdowns and limits for campaigns that can be tracked. Social media pages can help in reminding potential donors about a certain campaign in an interactive way, which can in turn, further last minute donations. Although challenges such as having different local languages or inadequate access to Internet are still being dealt with by NGOs to use social media to raise funds, using mobile apps for charitable fundraising is the next thing to watch out for in India. Samhita, an online philanthropic platform for supporting other NGOs states that using apps to improve operations for NGOs working on specific community based projects has big potential. Fundraising and online charity in India has come of age and Indian NGOs can and are using social media for a variety of objectives – from online promotions, recruiting volunteers, increasing campaign awareness to fundraising of course. More innovations in this area are awaited in the future. Good news for Indian B-schools: Finally climbing international rankings! Thanks for your initiative for needy people in India. I work for the Communications team at Teach For India and just came across this article. Just wanted to bring to your notice that you have spelt the name of our organization wrong. You have used the photo of our Facebook page and have mentioned our Fellows, but the name of the organization you have written as Teach India. We are Teach For India. Both Teach India and Teach For India are two different non-profits and it would be great if you could rectify the mistake. can you send me the updated link please? This still shows the same article with Teach India. Yeah, it has been updated. Somehow, our previous update did not go through, however, it is live now. Please check. Teach India & Teach For India are two very different organisations. The organisation you are referring to is Teach For India. Request you to please edit the same. Thanks for letting us know. We have made the edits.. Interesting to see the social media in India, but I miss some context behind, like internet penetration, concrete numbers. Also follow @guidestarindia on Twitter for news on philanthropy and nonprofit events in India! The donations received from the public are also used for massive religious conversions. World Vision is on of the example. It is an organisatioin backed by christian missionaries used to convert small children.